Press Capping Machine. 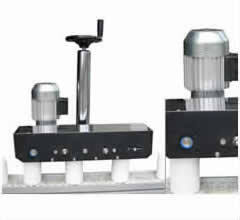 AK 0001 Conveyor Mounted Press Capper. Press capping machine. The AK0001 is a conveyor mounted press capper machine with a maximum output of 30 meters a minute. It operates interestingly by gently pressing the cap down without shock force, furthermore replacing hand pressing of the containers. Consequently eliminating wrist strain injury and is simple and fast to adjust for differing container sizes. It has variable speed control and most noteworthy is easily synchronised with existing conveyors resulting in positive control and guidance. First of all the output has a maximum of 30 meters per minute. Replaces hand pressing of closures as a result eliminating wrist strain and injury. Hence simple and fast to adjust for differing container sizes. Easily synchronised with existing conveyors. gently pressing the cap without shock force. Also Capping equipment for ROPP caps. As well as Indexing capping machines. In addition Press capping Machines. If you are unsure of the capping machine, but know the output that you would like to achieve. This chart gives estimated outputs as a result it helps you get an idea of the capping machine that fits your requirements. The output of the capping machines will vary depending on the type of cap. Screw, ROPP, Press, or Trigger and the cap size.